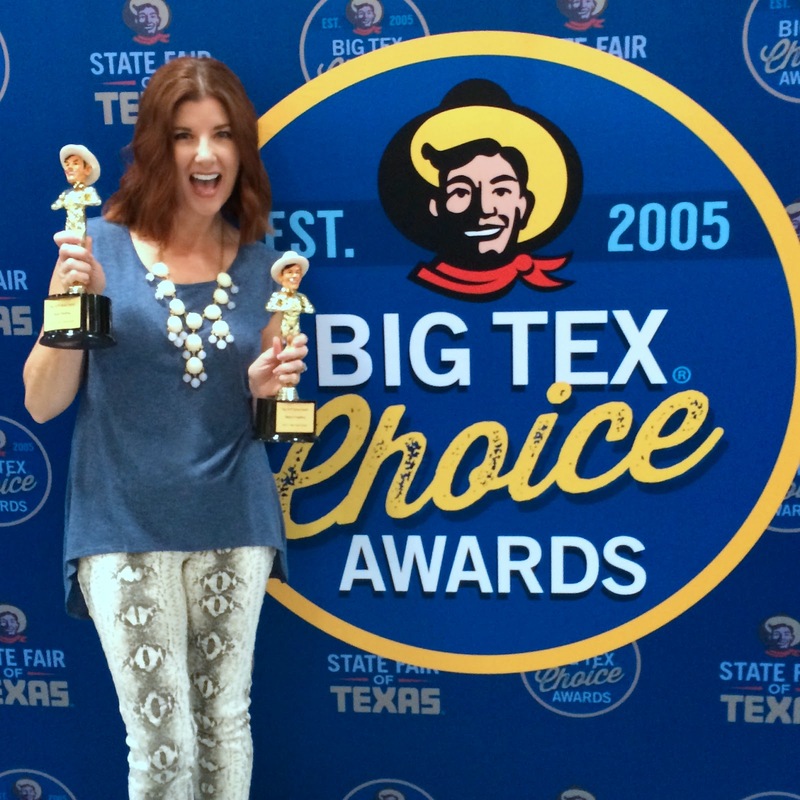 Yesterday, I was lucky enough to be a judge in the 10th annual Big Tex Choice Awards. My fellow judges were BBQ Snob Daniel Vaughn, Donovan Lewis from The Ticket and Tiffany Derry from Spike TV's Hungry Investors. There were eight finalists competing for the titles of "Best Tasting" and "Most Creative". After sampling all of the entires, the judges were unanimous in our decision that the award for "Best Tasting" should go to Clint Probst for his Fried Gulf Shrimp Boil. 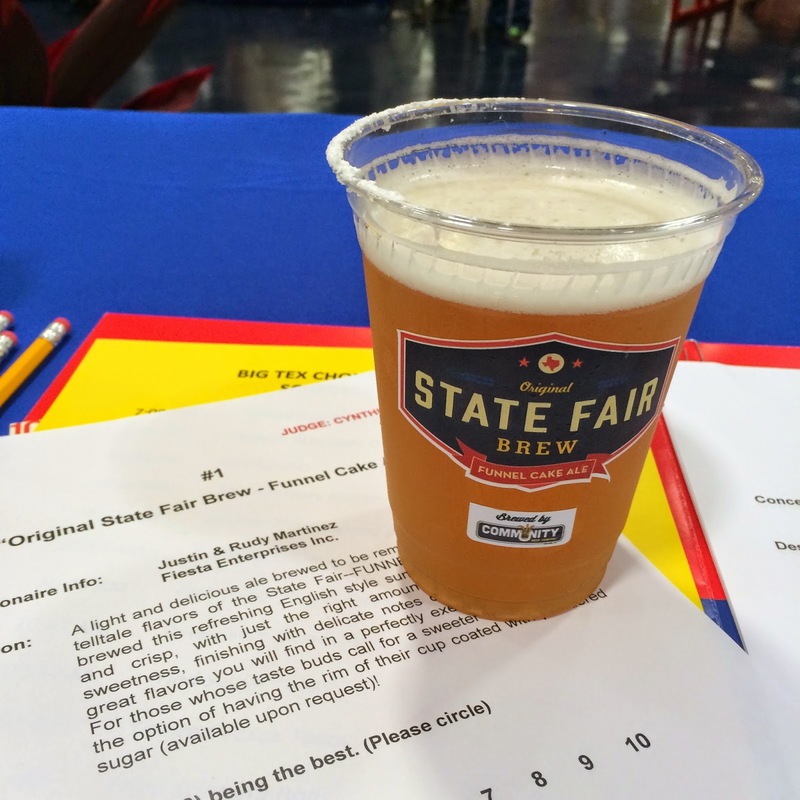 Justin Martinez took the title of "Most Creative" for his Original State Fair Brew – Funnel Cake Ale. DON'T MISS Clint Probst’s crowd-pleasing Fried Gulf Shrimp Boil. This Cajun creation features everything you would expect in a shrimp boil rolled into a ball, dusted with Fish Fry, and fried to a golden brown. Baby gulf shrimp, diced red potatoes, onion, lemon, and seasoning are formed around a cocktail shrimp, dusted and fried with the tail sticking out for a handle. Served with a remoulade sauce, the Fried Gulf Shrimp Boil is a unique take on a classic meal, with just the right amount of kick! As the only non-fried food in the contest, DON'T MISS Funnel Cake Ale. The Original State Fair Brew with its light and delicious ale, reminiscent of one of the telltale flavors of the State Fair – funnel cake! Justin Martinez’s refreshing English style summer ale has been brewed to be crisp, with just the right amount of toastiness and sweetness, finishing with delicate notes of natural vanilla; all great flavors you find in a perfectly executed funnel cake. For those whose taste buds call for a sweeter finish, take advantage of the option to have the rim of your cup coated with powdered sugar. 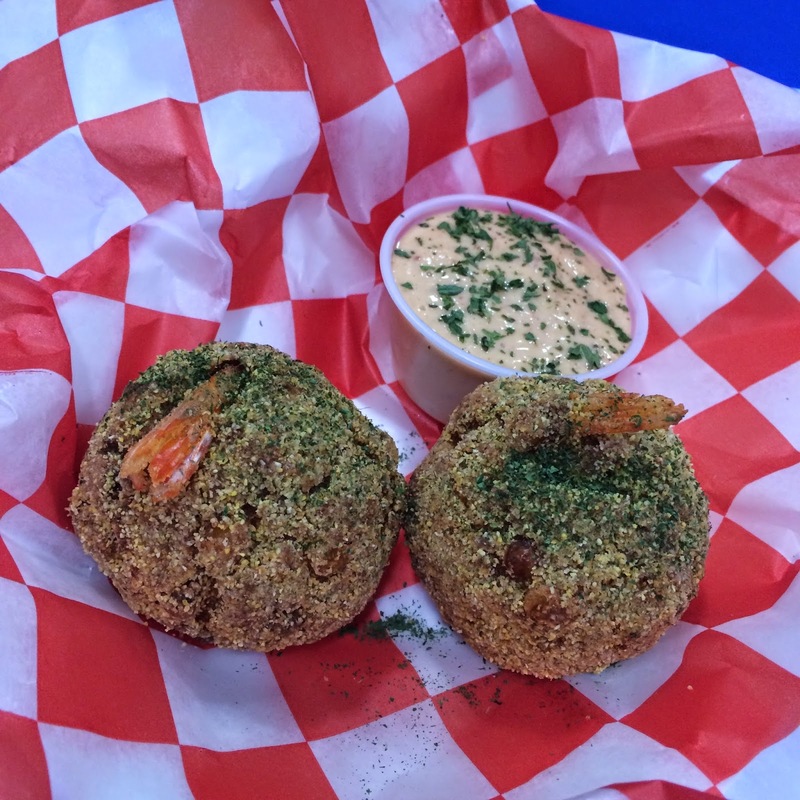 DON'T MISS the Deep Fried Texas Bluebonnet. This yummy creation is comprised of a blueberry muffin, scone-style batter that is stuffed with cream cheese, blueberries and sweet morsels of white chocolate. It is baked and deep fried to a perfect golden brown. This mountain of flavor is topped off with whipped cream, chopped white chocolate morsels, powdered sugar, blueberries, and a delicious blueberry glaze. It's not overly sweet because they use fresh blueberries and not a syrupy compote. This was one of my personal favorites. DON'T MISS the Fried Sweet Texas dessert. It starts with fresh pie dough filled with crunchy pecan pie, juicy peach cobbler, and creamy buttermilk pie. It is then deep fried until the crust is golden brown and flaky, and then served up with a side of Texas' own Blue Bell Vanilla Ice Cream. A real tribute to Texans and their amazing sweet treats! In the category of SAVE YOUR MONEY I am going to list Fried Sriracha Balls, a hush puppy-type combination of shredded chicken, corn, green chilies, tomatoes, and Sriracha hot sauce, formed into balls and coated with crispy tortilla chips. It is then flash-fried until golden brown. For those who like their food higher on the Scoville Scale, extra Sriracha Sauce is available. It was so spicy than my eyes watered. And I like spicy food but for the masses this will not be a crowd-pleaser. Twisted Texas Tacos was another disappointment. The pitch was "This taco starts off with tender, juicy hickory smoked Texas beef brisket, double-dipped in a barbecue spiced buttermilk batter and deep fried until it is robust and beefy. It is served in a warm flour tortilla, generously layered with a Mexican cheese blend, crispy fried okra, and a sweet and crunchy tri-color slaw, accented with zesty poblano and sweet pepper corn. Served with a creamy country gravy, spicy Texas Chili and a miniature salute from the Lone Star flag." The reality was that the tortilla was stale (or left on the grill too long), the meat was dry and tough and there was way too much slaw. While it looked hearty and like you would get a big bang for your coupon buck, the truth was that it was just a sad dried out taco. While the new foods always get lots of attention, don't miss long-time favorites like Fletcher's Corn Dogs or last year's Most Creative winner, Fried Thanksgiving Dinner. The State Fair runs September 26 through October 19. Visit www.BigTex.com for more information.